Historical fiction + fantasy + female main character = HAPPY CECELIA. Oh the fun I’ve had reading (and re-reading!) Patricia C. Wrede’s A Matter of Magic and Scott Westerfeld’s steampunk adventure Leviathan! More recently I’ve enjoyed Holly Webb’s Rose and Marie Brennan’s A Natural History of Dragons: A Memoir by Lady Trent. There’s just some mysterious alchemy about that specific combination that makes my heart happy. Catherine Jinks’ How to Catch a Bogle hit that sweet spot, and I (of course) ended up liking it. A lot. Young Birdie McAdam is an apprentice to Alfred Bunce, a bogler by trade. Well, what does a bogler do? He/she catches (and destroys) bogles for a living. Bogles are nasty, magical, child-eating creatures, in case you were wondering. Not that Birdie is doing any actual bogle-catching. No, she’s bait. Bait with a beautiful voice that’ll lure bogles out of their dark hidey-holes and into salt circles so they can be bound and disposed of. Birdie’s job is to be alert, quick, and follow directions. The only trouble is that the bogling business can be treacherous, on both supernatural and human fronts. When local pickpockets go missing and a nosey folklorist gets involved, Birdie’s life will change, whether she wants it to or not. Jinks’ novel is set in London, during (I presume) the Victorian Era. The neighborhood Birdie and Alfred live and work in isn’t very nice, but they scrape by fairly well – bogling work is steady. However, that doesn’t keep illiterate and clothes-mad Birdie from worrying about the future, about Alfred, and about being conscripted into Sarah Pickles’ pickpocketing gang. It’s a hard life, even if there’s food and shelter on hand. Then children start disappearing under mysterious circumstances, leading to a puzzle, an imprisonment and… I won’t spoil any more of it for you. Suffice it to say that the plot is thick, the characters interesting, and the setting and vernacular pitch perfect. Jinks’ moment of authorial genius (at least to my view) is the bogle. Or bogleS, I should say, as there are many, and they are varied. The creature isn’t just one type of thing, with one dangerous element. Each bogle might have a different monster characteristic and therefore the methods of containing and destroying it might be different, depending on the circumstance. Wondering whether the next bogle might have feathers, or breathe fire… that was interesting and kept the future of bogling open (creatively). At the same time, bogles were supposed to be terrible beyond belief, but as a reader, I was not frightened. There was only one scene that transmitted tension and hopelessness to me; otherwise the rest of the plot was easy to parse. But back to good things: Birdie herself. She’s enterprising, upstanding, honorable and loyal. Add in brave, but that goes without saying. Lest you think her insufferable, Birdie’s ‘goodness’ is tempered with practicality, and she serves as a perfect foil to Mr. Bunce, whose ethical waffling when money is involved make him slightly unpredictable (and realistically adult). I could have done with a few more moments of humor, but I think that may be an adult reader complaint, like my earlier not-scared-of-monsters moment. 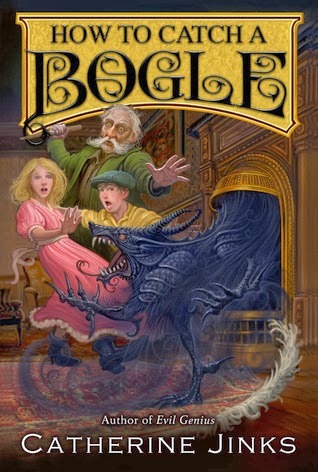 How to Catch a Bogle will appeal greatly to young readers with patience to wade through the vernacular in the early going and get absorbed in the story. Recommended for: fans of historical fantasy for children (think Holly Webb’s Rose or Gail Carriger’s Etiquette & Espionage), those who prefer girl heroines with agency and an excellent sense of adventure, and anyone interested in fantasies set in London. Fine print: I received a finished copy of this book for CYBILS consideration from the publisher (HMH Books for Young Readers). For some reason this one left me pretty cold, although it did have things I liked. I particularly liked the difference of point of view between Birdie and the woman who thinks she knows how Birdie should live her life. Liviania: I agree with you. I didn't mention Ms. Eames much in the review, but her & Birdie's differences of opinion will likely make for more fun in the following books.